On September 17th king Willem-Alexander will open the Dutch parlament. Princess Beatrix, Princess Margriet and Pieter van Vollenhoven will not attend. Hopefully they will be present at the cabinet of the King to see the procession, like Queen Juliana always did after her abdication. Looking forward to it,two weeks from today! Amalia will only start to attend Prinsjesdag when she turns 18 right? Any reason why Princess Margriet and Pieter van Vollenhoven will not attend anymore? Thought they would still attend as she remains a member of the Royal House and in line of succession and that only Princess Beatrix would stop to attend. The newspapers didn't give an explanation for the absence, they just state that the couple will not be present. The cortege and attendance at the Hall of Knights will be restricted to TM and TRH only which is in line with what happened in 1980,only Queen Beatrix,Prince Claus and Margriet and Pieter were in attendance..That was the case for 5 years,until Alexander turned 18 in 1985. Ofcourse the then Queen's sisters had no place in-line to the Throne anymore at the time,but it just shows that after a change on the Throne it will be just TM and their next of kin,i.e.,Prince Constantijn and Princess Laurentien.Plus the route will be like last years,not passing the Cabinet of the King but a more direct route. Looking forward to this event,its a firm favourite of mine but will be a little sad not to see Beatrix or Princess Margriet. The Throne at the Hall of Knights is ready,including the new WA cypher. Pic is for public use! It will be the first time today that a King will deliver the Speech from the Throne in the Hall of Knights and the first time also that a Queen will be seated next to the King on the daise. Kings Willem I,II & III delivered the speech in a different Hall while none of their Queens was seated beside them.The Thrones used are the same that have Always been in use.The last who was seated on what will be Máxima's was Prince Claus. During the Reigns of Queens Wilhelmina,Juliana & Beatrix their spouses were always seated next to them on the daise. Maxima in gold. Looks great, that hat is similar to that hard pink hat she had last year. I miss WA military uniform, that was way more regal than that suit. It find it also strange that do to WA not wearing an uniform he does not wear as Order sash but Máxima wears it. it's great to see the new king and queen in prinsjesdag! I thought the exact same Stefan,I'm sure we'll get an answer from our Dutch members. I am not sure about the color of Máxima's outfit. She fades in the background since the color matches the carpet and the golden pattern on the throne. 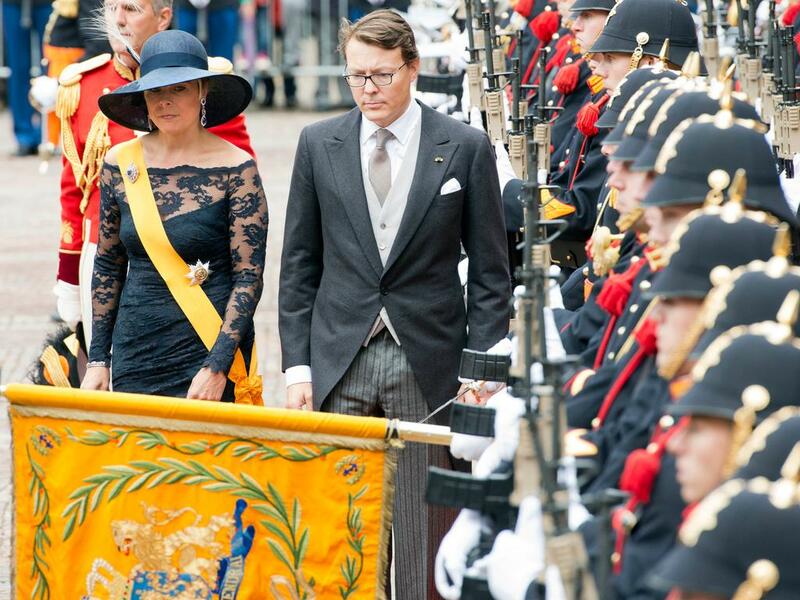 I am puzzled as well why the king and prince Constantijn do not wear a sash while the queen does. They either have to upgrade the dressing code of the men or downgrade the women. The present effect is odd, but it was always the case: prince Claus and Pieter van Vollenhoven never wore a sash either during Prinsjesdag. The king started with a personal note, about his mother, the enthronement and the support after the death of prince Friso. The King did wear the insignia of the Knight Grand Cross of the Military Order of Willem.The only link in dress that refers to him as the King. As jewelry the Queen used the elements of the Borneo parure for earjewelry and broche. A uniform isn't appropriate in Parliament,one doesn't want them to surrender....grin...albeit...oh...sometimes..But no,HM will Always wear jaquet as we call it,morning dress to all others. At the start of the speech HM did refer to how gratefull he is towards his mother,the heartwarming start of his Reign on april 30th and the tragic death of Friso and the support the family received for which they are most gratefull.Both the King and Queen were emotional for a short time as HM uttered the words on Friso.Moving. Does it ever rain on Prinsjesdag? The Dutch Royals always seem to blessed with a bright autumnal day. There have been Prinsjedag days...grin...with drizzle yes,both from the Dutch crying their eyes out after hearing the government plans,and due to weather conditions too...hmm.. But ib general,there is often something magical in that sooner or later a patch of sun appearsa.We call that an Oranje zonnetje...an Orange sun..
Is it just me and pardon my gush, but aren't they the most beautiful King and Queen!!! Princess Beatrix must be sooooo proud!